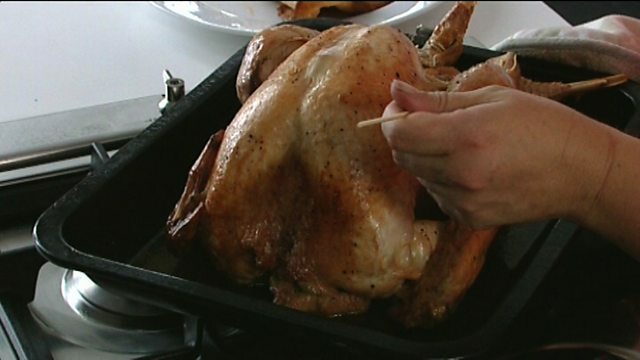 When a turkey (or other bird) is cooking, the heat finds it hardest to reach the part where the thigh meets the breast. Test the bird for doneness here to be sure the rest of it will be cooked through. -Cut the skin where the breast and thigh join. -Pierce the thigh or breast meat that's exposed by the cut skin, in the thickest part. -If the juices run clear, the turkey is cooked through. If they are still pink, return the bird to the oven for a further 20-30 minutes, then try again.